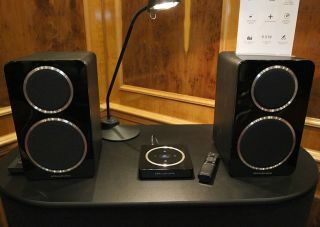 Wharfedale launches Diamond Active A1 speakers, teases new Reva range | What Hi-Fi? If you’re a fan of the Wharfedale Diamond 220 speakers, you’re in luck. The company has just launched a pair of active wireless speakers based on the 220s. Behold, the Wharfedale Diamond Active A1. These are active wireless speakers with a twist: there is a separate control hub that handles power and sources. It communicates with the speakers with an uncompressed 5.2/5.8gHz wireless signal, with a claimed range of around 20m. Wired connections include coaxial, optical and RCA inputs. There is also aptX Bluetooth for wireless streaming. The price is yet to be confirmed, but we’ve been told to expect a Spring 2016 release. Wharfedale has also teased a new range of speakers at Bristol 2016: Reva. Details are thin on the ground at the moment, but we know this range this is one up from Diamond and we can expect new drivers and cabinets. These are also due in Spring 2016 – full details to follow.